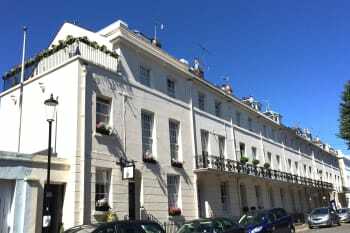 Berkeley House is a Grade II Listed 1820’s Regency town house in the centre of the county town of Lewes. This beautiful building has been refurbished to provide first class accommodation. TripAdvisor reviews have resulted in Certificates of Excellence since 2015. We offer 1 en-suite room (no breakfast), beautifully presented to include excellent en-suite shower facilities, free wifi, flat screen TV with DVD player, a DAB radio with iPod dock and alarm. Ideally suited to professionals working locally, the room is available weekly for 3 or 4 nights. There are no rooms available at Berkeley House for these dates. Parking: On street parking is available at a charge of £2.00 per day. Parking is available nearby at a charge of £5.00 per day. The welcome, the service, the room, the breakfast, they were all excellent. Amanda was an exceptional host from our arrival to our departure the following day. Nothing was too much trouble and I would definitely stay again (and recommend to friends) if I was in the area. This is our second stay and if we are in this area we would look to stay again. Friendly, attentive and helpful but not intrusive. Spotless and great breakfast. Great town to wander round, lots of historical interest. Great walks nearby. I thoroughly enjoyed my stay. I would reccomend Berkely House as a warm and friendly B&B to visit. Amanda was extremely welcoming and friendly and the B&B is ideally located for exploring Lewes as it is just off the High Street. Breakfasts were delicious and Amanda even made us pancakes as it was Shrove Tuesday!! Highly recommended. Erawan Thai is lovely as is Symposium next door where you can choose your wine to BYOB. We were very impressed by Côte - delicious food and excellent service. Very welcoming and hospitable. Excellent breakfast. The bedroom was cosy, warm and nicely decorated. I felt very relaxed and had 3 terrific nights sleep. Anne of Cleaves house is shut Nov and Dec! Take a walk round the village, the architecture is sublime. The views from the castle tower are breathtaking. The Pelham Arms did nice food. A very warm welcome upon arrival, lovely room/W suite with great attention to detail (Xmas chocolates left on bed & lovely tea/coffee selection inc cookies) breakfast absolutely beautiful, vast choice catering for everyone, personal favourite was the homemade granola fruit & yoghurt to start. Amanda was very welcoming. Room was nice, with a large shower unit. Breakfast was very filling. Pelham Arms, worth a visit for a meal. The church near the Pelham Arms is worth a walk around, in regards to the "anchorage. "The castle is worth a look. Berkeley house is extremely clean, the room was lovely and the owner, Amanda, was welcoming and friendly. We really enjoyed our stay there. I would highly recommend it. I had a wonderful stay and highly recommend the Berkeley House to others. The central location of the B and B was ideal. Amanda and Adam were gracious hosts making my visit to Lewes both enjoyable and memorable. Great location, lovely room, really nice shower and delicious breakfast. Loved the little cookie jar in the room, a nice treat! We went to a concert at the All Saints Centre, dinner at the Rights of Man pub. Great local beer (Harvey’s) too. Really great place to stay - the owner is extremely friendly and helpful and there are nice extra touches such as cookies/cake left with the coffee/tea. We stayed in the suite, which was extremely cosy and warm. The Anne of Cleves house is a 'must'. Lovely place for a weekend visit. Great vibe and friendly locals. Good pubs Castle worth a visit. We had a lovely stay at Berkeley House. Our room (Yellow Room) was fantastic with comfy beds, a really good en-suite with a huge shower, and breakfast was delicious! We are hoping to return very soon. Beautifully presented rooms in immaculate condition. Very comfy beds! Our host Amanda is exceptionally welcoming and friendly - this is the second time we have stayed here and will probably come back again next year. I love coming here because I feel cherished, particularly with regard to diet. Amanda couldn't have been more friendly or helpful - a lovely place to stay, in the centre of a lovely and historic town. And being able to park outside the front door was a big plus. Lots to find out and explore - bonfire societies, bookshops,Tom Paine, 'we wunt be druv', Harvey's, the Lewes pound, the castle, the market ... etc. Everything was correct, clean and the breakfas delicious. Amanda and her husband are very friendly and professional. They help you in everything you need. Definitely is a very recommendable plase and I’m sure to repeat in the future. Amanda is a most attentive host, we had a wonderful 3 nights stay and we would very much like to return. Lewes is a lovely town. Our stay at Berkley House was our favorite of the trip. Amanda is friendly, accomodating and really helpful in planning our activities in Lewes and along the Channel coast. The white cliffs around Beachy Head are must-see. We also enjoyed the Bloomsbury haunts: Charleston and Monk House. If you can go farther afield, the gardens at Sissinghurst and Greater Dixter are outstanding. Our stay at Berkeley House was excellent. It's in a very convenient location, is very comfortable. Very personable service, & very nice breakfasts. Very central location & our host Amanda was welcoming and helpful. Amanda and Adam gave us a great welcome and provided lots of information about Lewes. Beautiful room and very quiet. Everything was spotless. Fresh milk provided for cups of tea/coffee etc. Excellent breakfast, we both had smoked salmon and scrambled egg. We ate at the Snowdrop Inn which is a bit of a walk but the food was very good and reasonably priced. Great atmosphere. Only stayed the one night before catching a ferry from Newhaven which is very convenient. We parked without any problem in the High Street overnight. 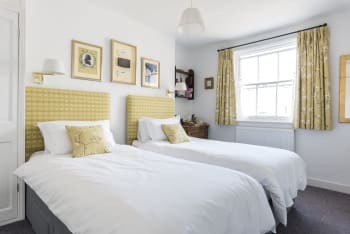 We would definitely stay at the Berkeley House again and combine it with a long weekend in Lewes as there is so much to see and do in the immediate area. Amanda was helpful and kind as always. Good breakfast, clean and beautiful room, friendly and cheerful atmosphere at the dining table. Good location to explore the town. About 10 minutes walk from Lewes Station. A wonderful gem ! Pretty garden, delicious breakfast and very friendly hostess. Spent very pleasant 3 nights in the Yellow Room. Enjoyed being able to use the small roof terrace. Everywhere was very clean. Breakfast is a high point given the quality of food (taste, presentation and wholesomeness) and the atmosphere enjoyed around the communal table. Amanda, our hostess, was welcoming, friendly and a font of local knowledge. Bus service to Brighton is on the "door step" and very frequent. You were very welcoming, friendly and really helpful. We appreciated the tips for parking and the permit is a great asset in a town like Lewes. Breakfast was fresh, delicious and plentiful. The Blue Room was comfortable and well appointed if a little bijou. The shower was great. Lewes is a really interesting town with plenty of independent shops on the high street. We visited Twinkle Twinkle, a woman's boutique with a lovely, unique selection of clothes. We also popped into Flint Owl Bakery and were delighted with the range of delicious looking bread and cakes. Very well run and very good breakfast. Thoughtful owner ,always available. Good decor. Bus station is just around the corner and Flint Owl bakery is next door. Flint Owl has delicious food and great to get provisions for Glyndebourne picnic. Waitrose is very near too so very easy to get picnic food. Easy to get bus to Brighton -- drops you just beside Brighton Pavillion. Local buses to Charleston Alfriston Firle make for an interesting car free stay. Very nice reception after a hard days cycling. Beautifully clean and modern. Can walk everywhere. Just felt at home immediately. Amanda is the perfect hostess. Very helpful, efficient, and gracious. The room was lovely and the food tasty. This was excellent accommodation. Good personal service and top quality breakfast. Centrally located. Very convenient for all that Lewes has to offer. Accommodation very clean and welcoming. Breakfasts were very nice. Would use again when next in Lewes as parking arrangements are good. We ate at Pizza Express and Ask. We visited Lewes Castle, Anne of Cleves House, Lewes Priory and a lovely local park. Many excellent independent local shops. Already left feedback on trip adviser.I appreciate space in the Yellow Room is limited. If possible a chair to put things on would be useful. Loved the breakfast. A very warm welcome and a very pleasant stay. I can't fault the hospitality at all. My only comment would be to pop a sign on top of the door leading to the balcony that says 'watch your head' as despite being pre-warned we nearly came a cropper a couple of times. We will definitely be paying a repeat visit at the same time next year thanks very much Amanda for making us feel so welcome and the finishing touches were noticed and much appreciated. An excellent place to stay. Lovely room, and a great breakfast. Very friendly owners who also gave us very good advice regarding places to visit. Particularly welcoming. Delightful place, excellent breakfasts. Enjoyed the little terracee. Good beer and welcoming at the Snowdrop. The Brewers Arms didn't serve food after 8pm. If visitors go to Brighton, avoid the Lanes, North Laine is more interesting.i360 is worth a trip. Another brilliant stay. Amanda and team are great, nothing too much trouble, great breakfast and fab Glyndebourne picnics. There is no other choice in Lewes ! Bills is good restaurant. Lewes taxis very reliable. We visited Lewes for 3 nights while attending a wedding in Eastbourne, and really enjoyed our stay in the Blue Room. It is on the smaller side, but suited us as we were out most of the time. 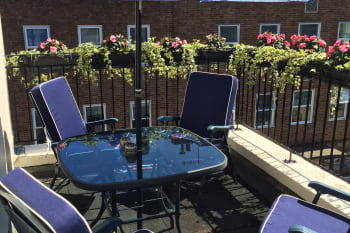 The location is excellent, about 5-7 minutes to the train station and just off the High St with shops, cafes, and restaurants. Amanda's daily breakfasts were delicious, and we were grateful for the individual attention and care she showed for every guest. Would definitely return! We had a five star experience at Berkley House with no detail uncovered. Thank you! I had a terrific time at Berkeley House! The house is absolutely beautiful and the staff so personable! Thank you! Great to get such excellent feedback from such a lovely guest! We enjoyed our stay. Amanda was very helpful, the breakfast was delicious and the location is great. We did not like that we had to go across the hall to a separate bathroom. I had not seen that disclosed on the website, but maybe I missed it. I would have paid more to have had an ensuite bathroom. Also would have liked 2 luggage racks in the room, as we put one suitcase on the floor. Stayed in The Apartment. Lovely to have the additional space. Excellent location. Amanda really could not have been more helpful. Lewes is a lovely town and very convenient to jump on a bus to visit other places. Would suggest making reservation for evening meal. Thank you so much for your lovely review. It was a pleasure to have you to stay and you are our first guests who've made a visit to Brighton's sewers! I never knew the tour existed, but you learn something every day! So glad you enjoyed the Apartment and Lewes and hopefully we'll see you this way again soon. All the best, Amanda. Excellent facilities. Really nice rooms, better than a hotel. Breakfast was cooked in front you with great conversation. I was at a court case and this was very convinient for the court. Good wifi for working etc. Would thoroughly recommend this place to stay. I went for a run up the downs and it only took a few minutes to get out of the town on foot and into the downs. Stay here it is worth it. My second stay, and it won't be my last. Thank you! Lovely guesthouse, fantastic history but modern facilities and decor. Great breakfast as well. Quiet but central and wonderful service. 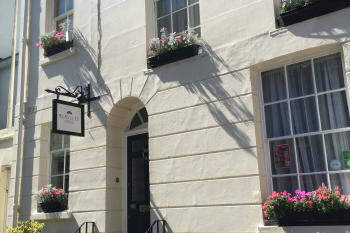 A very smart upmarket b&b right in the centre of Lewes. Amanda is a great host and nothing is too much for her. The rooms are very tastefully decorated and the shower (in the en-suite bathroom) is excellent. There is a wide choice of food for breakfast and a good time to chat with Amanda and get some great tips on where to go and what to try locally. Or you could just put the world to rights as we did. A thoroughly enjoyable experience all round. Highly recommend. Great walks on the South Downs - walk from the house for about 45 minutes to reach a good point to start. Also, pottering around the local shops including the numerous antique ones is a must. You can have a day at the beach in Saltdean or Rottingdean and Brighton is very close too. In fact you could stay for a good few days and try everything. Very quiet but central to town centre. Parking difficult in street but nearby car park was free from Sat night through to Sunday. Room was very well appointed. No en-suite to this room but private shower room across the landing and robes provided if required. Lovely breakfast. Whole place scrupulously clean. Owner so helpful and friendly - couldn't ask for better. Hope I can return again. Be aware of parking - pack so you can easily transport - not like us who just throw everything in the car!!! We had a lovely stay at Berkeley House - the room was beautifully appointed and comfortable, and the locatio ideal. Amanda was a wonderful host, seeing to all of our needs and providing a truly excellent breakfast for our various dietry requirements! Would highly reccommend. Real Eating Company on Cliffe High St - great lunch. Excellent bed and breakfast in the heart of Lewes, with warm welcome from delightful owner. Nothing too much trouble. High level of cleanliness and very comfy beds. Can highly recommend. Lovely hosts, very friendly and accommodating. We were attending a local wedding and were able to leave our bags early. Great house, very well decorated and furnished. Very comfortable beds. Beautifully run boutique bed and breakfast right in the centre of town and close to all amenities. The service was second to none and the breakfast was superb. Establishment ran by very efficient staff and nothing was too much for them. Really helpful. Castle, Anne of Cleves House and local pubs. Lewes is a small town that punches above its weight with many interesting galleries and art venues. The Sussex Guild has some really interesting work and the St Anne's Gallery had a wonderful exhibition on when we were there. Wonderful - Lewes is quite an amazing town and I love the description that "it punches above its weight". Spot on! So glad you enjoyed your stay with us and that you were comfortable here. Very best wishes. Amanda. A great period B&B situated close to the high street, pubs, restaurants and shopping. Nicely quirky, relaxing and comfortable, but with great new showers/bathrooms - although a colour other than pure white would be a bit more homely (but then I'm fussy). Breakfast great, with more than you could want for, all cooked and served with a smile. An honesty bar, for a pre-dinner beverage would be the icing on the cake! Many good restaurants and pubs within easy walking distance. I have stayed here 3 times and always enjoy the experience. Very comfortable. If you are going to Glyndebourne and are short of time, there is a very good Waitrose in Lewes less than 5 minutes walk away if you are happy with a picnic rather than an elaborate meal at Glyndebourne. A smart, tastefully decorated period home with a lovely courtyard garden run by very pleasant, friendly and helpful owners. Varied, well prepared and healthy breakfast choices available. Welcoming, luxuriously comfortable, excellent breakfast with Clonakilty black pudding! Amanda was very friendly and helpful. Shower was superb! The Pelham Arms was a great place to eat. Friendly and good quality food. Best B&B experience ever. Amanda was a wonderful host! Beautifully decorated house, quiet room with comfy bed. Fantastic breakfast cooked to order every morning. Perfect location for exploring Lewes. Liked the attention to details eg bone china mugs in bedroom, good selection of teas/coffees and refreshing of bottle water. Breakfast hearty and tasty. Accommodation nicely maintained. Helpful advice from Amanda was much appreciated. Amanda was incredibly friendly and bent over backwards to make our stay so perfect. The accommodation is beautiful and spotlessly clean. A great stay! super service, great location and Amanda was a lovely host. Really enjoyed my stay at Berkeley House. Loved my room and had a very good night's sleep. Amanda is a fantastic host who made us feel very welcome and cooked a amazing breakfast I would definitely come back again. We only stayed one night but would love to have spent more time at Berkeley House. Amanda gave us a very warm welcome, the room was extremely comfortable and the breakfast perfectly cooked. What more could you want? Highly recommended. Staying in Berkeley House is like a home from home. The facilities are very clean with everything you need for your stay. The showers in particular are awesome! You are made to feel very welcome and whatever you would like cooked for your breakfast. I would and have recommended Berkeley House to my work colleagues and friends. Located centrally in Lewes there are plenty of local restaurants and bars within walking distance. Berkeley House is a welcoming place. The room was ideal, clean and comfortable. Breakfast was very tasty and set me up for the day. Very friendly, good facilities, excellent breakfast. Famiglia Italian restaurant was excellent. Not fancy but very good food and servicke. Very natural and friendly hosts. Excellent beds and sheets and everything lovely and clean. Good breakfasts with a good variety. Really enjoyed our stay. An excellent base to visit wider Sussex. Idyllic and inspiring Charleston and pretty Alfriston. The artisan bakers around the corner is scrumptious! Very comfortable and Amanda had thought about lots of little extras to make my stay special. This is clearly a lady who takes pleasure and pride in running Berkley House. A real pleasure to stay.